All of our rustic fireplace mantels are one of a kind. We offer reclaimed wood beams, Juniper logs, and wood slabs. They are also native to the USA. 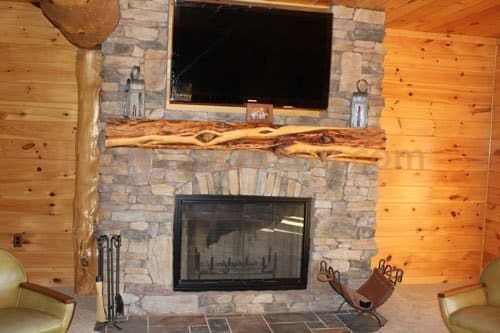 We also offer rustic fireplace mantel most any size. The saying we have is if we do not have the size you need we can try to find it. 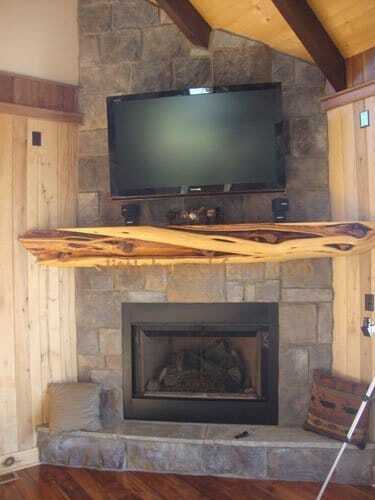 Yes, we also offer custom built fireplace mantel designs and hand-forged fireplace tools. Also, we work with a colonial style blacksmith an antler artist and other local handcrafters. Because this gives us diversity and the ability to offer other custom furniture options. A fireplace mantel will make or break the way a room feels. So choosing the correct piece is important. 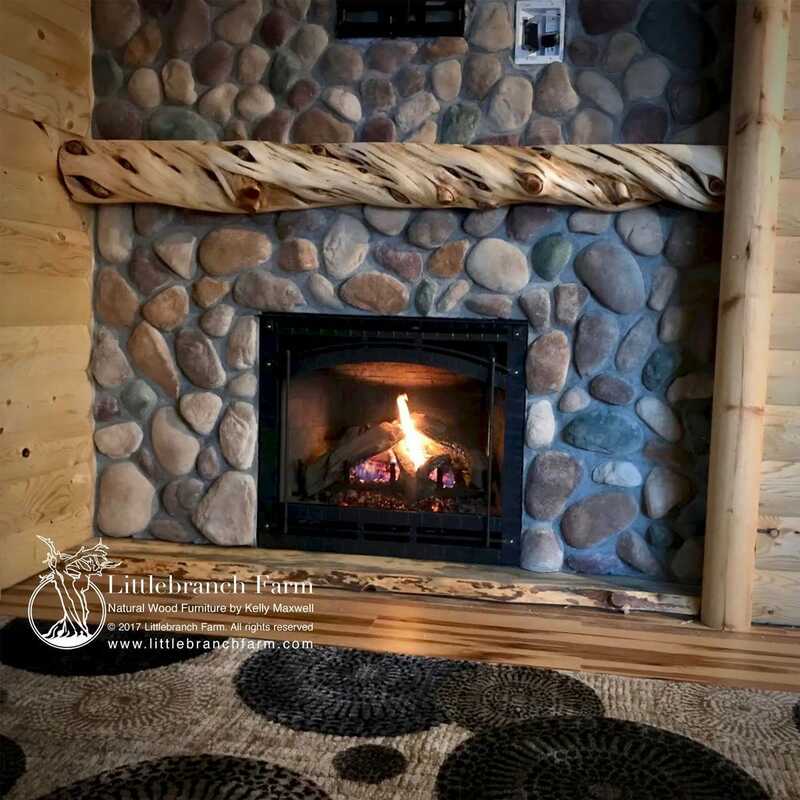 Because of so many options, let’s see if we can help walk through the options we offer in rustic fireplace mantels. Custom river stone is the backdrop for this juniper log mantel. 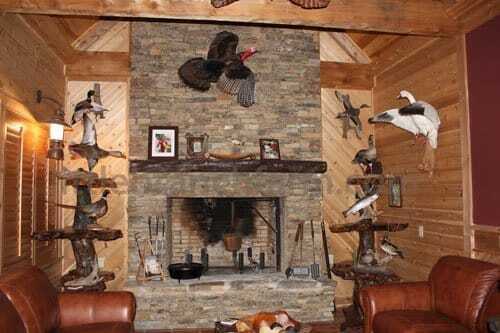 Some of the most popular being the wood slab mantels. This style can be found in salvaged old growth redwood, black walnut, oak, and maple. Although the oak and black walnut are not common and are even less common in thick pieces. We mainly offer redwood and maple. We source all of our Redwood mantels from logs and root systems left behind on the forest floor by the turn of the century loggers. Also, we use big leaf maple logs as mantels. The wood slabs can have a live edge or not. 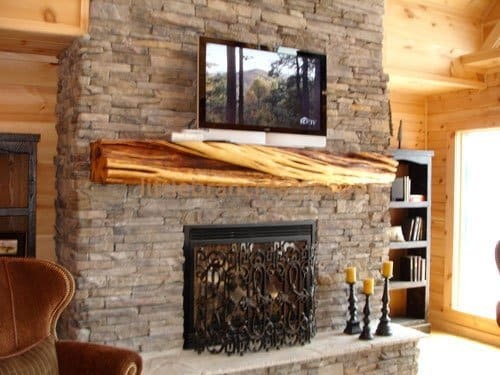 By leaving the natural edge (live edge) on the mantel it creates an organic natural feel. But if it is milled with straight cut it is a mid-century home decor style. Furthermore, the second most popular is our Juniper log mantel. Also, referred to as twisted juniper. They have an array of colors of creamy white to reddish brown and black. Some will have a corkscrew look as the log twisted during its growing years. They may also have gnarly knots and deep crevasses with rich color tone transitions. We commonly mill these mantels with a flat top and back. This allows for easy mounting and a flat display shelf. We also use reclaimed wood beams salvaged from old barns and other buildings. They make great fireplace mantels and feature circle saw marks or hand-hewn makes. The most common color is brown but if exposed to sunlight they will turn gray. As a result of being part of a building, they will have mortise and tenon joints with hand-carved wood dowels. Because this style rustic fireplace mantel is classic and looks great in many home decors. You can use corbels to mount this style fireplace mantel or mount as if it is floating. Driftwood mantels are elegant and simple but some of the most unique. These are a brown to gray color tones. But not all driftwood makes a great fireplace mantel. Because our most common are from a redwood root that ended up in rivers and the ocean we are limited o inventory. Because we take special care in milling a flat back and top shelf and maximizing the uniqueness of the driftwood as a mantel. If you are in the market for a fireplace mantel whether in a new construction or updating an existing mantel give us a call or email. If you are in the Nashville, TN area please stop by our studio and say hi. Also you can check out our rustic style rustic furniture designed and built by custom furniture maker and Kelly Maxwell. Consequently, the mantels on this page are examples of past projects. To see our current inventory visit the store online. If you do not see a size or style you like to contact us as we always have unfinished mantels available. 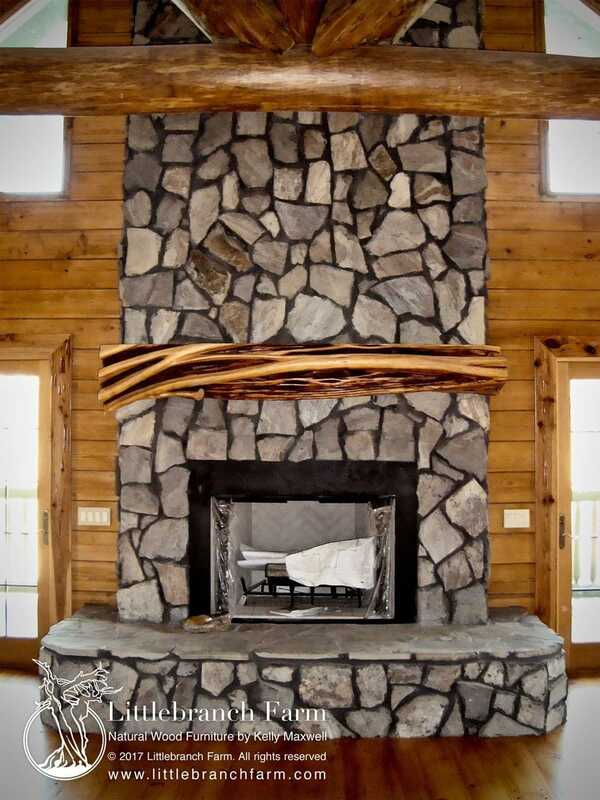 Another twisted juniper log mantel feature in a Blue Ridge cabins model log home. 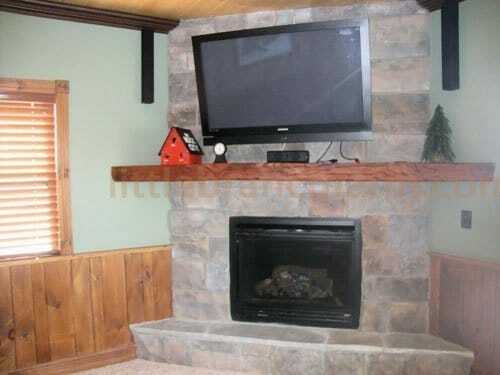 In addition to the great color, this is nice twisted wood log mantel . Another simple natural live edge wood slab as a mantel. Another juniper log mantel featured in it home. Natural rustic fireplace mantels crafted using live edge curly old growth redwood with a clear coat finish.